Urbann are a new name in the garden room industry. The Newcastle based company specialise in timber frame design and build projects such as contemporary house extensions but have recently created a range of modern garden room designs. Urbann garden room designs are aimed at buyers looking for a design that stands out from the crowd. They have created 12 different designs available in various sizes. Some designs are aimed at uses such as a home office while bigger designs can incorporate kitchen & shower room facilities making them great entertaining spaces. Urbann also offers a bespoke design service, so any of their designs can be tailored to your individual needs. They offer free site visits throughout the UK as the starting point for creating your unique garden room building. The building sits on a concrete raft foundation. The floor incorporates 100mm of insulation while the walls and roof include 150mm of insulation. The roof is covered in a Sarnafil single ply PVC membrane which is a highly durable alternative to EPDM membranes offered by many garden room companies. The exterior of the garden rooms is clad in an open-jointed Western Red Cedar cladding. Urbann have designed a hidden rainwater system removing the need for ugly guttering systems to be on show. You can choose to use either uPVC or aluminium framed; Argon filled double glazed doors and windows. There are options to use frameless windows in some designs which create a very striking look. The interior of the rooms are fully plastered and decorated with the option underfloor heating, air conditioning or a feature log burner for heating. The electrical options are well specified with low energy LED lighting, app-controlled heating, lighting and sound systems. There is the option to incorporate kitchen and shower room facilities into some designs creating a self-contained entertainment space in the garden. It generally takes around 12 weeks from order to completion of a project. Prices for the Urbann garden room range start at £14,450 for their 3m x 3m Cuba garden office. 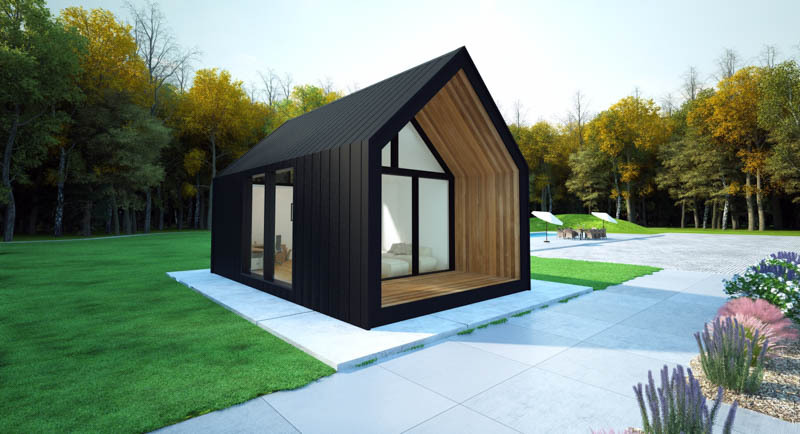 To learn more about this new range of modern garden room designs talk to the Urbann team on 0330 350 2202 or take a look at their website to learn more about them.